At first glance, Scooby Apocalypse #1 looked like a desperate attempt to update the classic animated series into a gritty modern dystopian tale. I'm glad to report while it does admittedly reference a "hipster doofus" in Shaggy, he's not, this new series honors the mystery busters while giving them relevance in the modern age. All the well-known characters - Daphne, Fred, Velma - are much sharper and more mature than I expected.There's some serious business at hand but the issue balances the humor you'd expect with explaining the peril not only the gang is in but the world around them. Scooby Apocalypse is more than meets the eye. From a concept by Jim Lee, the gang comes together through Velma's effort to expose her organization's efforts to alter humanity. Fred and Daphne are has-been reality show stars downgraded to an obscure cable channel show, Shaggy is Scooby's dog trainer and part of Velma's company to give dogs greater intellect. Despite this new premise, these beloved characters are true to their nature sans the silliness associated with the cartoon. J.M DeMatteis and Keith Giffen add layers and dimensions to the gang and give Velma a boatload of exposition to get through to. It's not Mr. Johnson in a werewolf mask anymore, there are some serious monsters on the loose this time. Howard Porter does some impressive world-building with great detail and realistic character designs that still retain the essence of the gang we know and love. The color schemes of the characters are traditional even though the clothing is updated but it all works even Shaggy's hipster look. I mean, he's given up the slacker/stoner appearance for a modern update that's more functional and mature but probably still smokes out sometimes. Hi-Fi infuses pages with bold bright colors that elevates the book with richness and depth. 'Scooby Apocalypse' is an unexpected joy full of smart fun that mixes nostalgia with fresh present day drama. 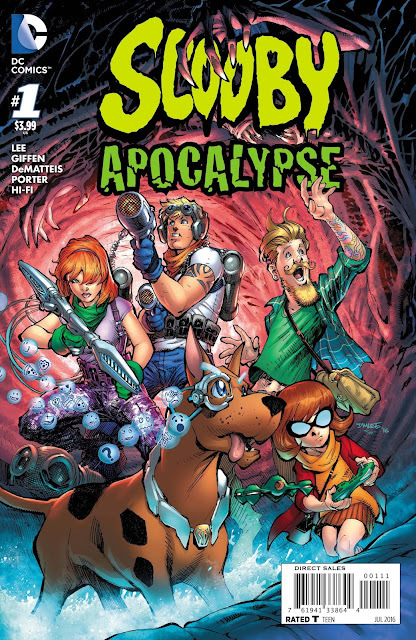 Issue one sets the groundwork for a great adventure and with top-tier talents like Giffen, DeMatteis, Porter, and Hi-Fi behind it, they're giving Scooby and the gang the story they and fans deserve. I was already on board with Future Quest and Wacky Racelands, I think I'll get this too.